Herbs and Natural Supplements, 4th Edition: An evidence-based guide is an authoritative, evidence-based reference. This two volume resource is essential to the safe and effective use of herbal, nutritional and food supplements. Volume 1: The first volume provides a foundation of knowledge in the clinical practice of complementary medicine. It emphasises safe practice with strategies to prevent adverse drug reactions, guidelines in assessing benefit, risk and harm and the evaluation of research. 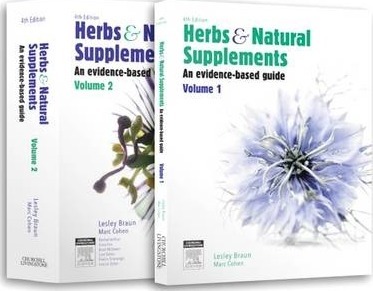 Volume 2: The second volume provides current, evidence-based monographs on the 132 most popular herbs, nutrients and food supplements. Dr Lesley Braun is a registered pharmacist and naturopath. She holds a PhD from RMIT University, Melbourne, Australia, in which she investigated the integration of complementary medicine into hospitals in Victoria. Dr Braun is an Adjunct associate Professor of Integrative Medicine at the National Institute of Complementary Medicine at the University of Western Sydney in Australia. NICM provides leadership and support for strategically directed research into complementary medicine and translation of evidence into clinical practice and relevant policy to benefit the health of all Australians. Dr Braun serves on the Australian Therapeutic Goods Advisory Council which oversees the implementation of TGA reforms and provides general strategic guidance to the TGA, advice on relationships and communication with stakeholders. She is also on the executive for the Complementary and Integrative Therapies interest group of the Clinical Oncology Society of Australia and an advisory board member to the Australasian Integrative Medicine Association. As of 2014, she is also the Director of Blackmore's Institute, the academic and professional arm of Blackmores, which entails engaging with a broad range of academics, government and industry bodies and overseeing a comprehensive academic and research program. Since 1996 she has authored numerous chapters for books and more than 100 articles, and since 2000 has written regular columns for the Australian Journal of Pharmacy and the Journal of Complementary Medicine. She lectures to medical students at Monash University and to chiropractic students at RMIT University, and is regularly invited to present at national and international conferences about evidence-based complementary medicine, drug interactions, complementary medicine safety and her own clinical research. Her role as the main author of Herbs and Natural Supplements - An Evidence-based Guide represents a continuation of a life-long goal to integrate evidence-based complementary medicine into standard practice and improve patient outcomes safely and effectively. Professor Marc Cohen is one of Australia's pioneers of integrative and holistic medicine who has made significant impacts on education, research, clinical practice and policy. He is a medical doctor and Professor of Health Sciences at RMIT University where he leads postgraduate Wellness Programs and supervises research into wellness and holistic health including research on yoga, meditation, nutrition, herbal medicine, acupuncture, lifestyle and the health impact of pesticides, organic food and detoxification. Prof Cohen sits on the Board of a number of national and international associations including the Australasian Integrative Medicine Association, the Global Spa and Wellness Summit and the Australasian Spa and Wellness Association, as well as serving on the Editorial Board of several international peer-reviewed journals. Prof Cohen has published more than 80 peer-reviewed journal articles and co-edited the text 'Understanding the Global Spa Industry', along with more than 10 other books on holistic approaches to health. He is a frequent speaker at many national and international conferences where he delivers inspiring, informative and uplifting presentations. His impact on the field has been recognised by four consecutive RMIT Media Star Awards as well as the inaugural Award for Leadership and Collaboration from the National Institute of Complementary Medicine.